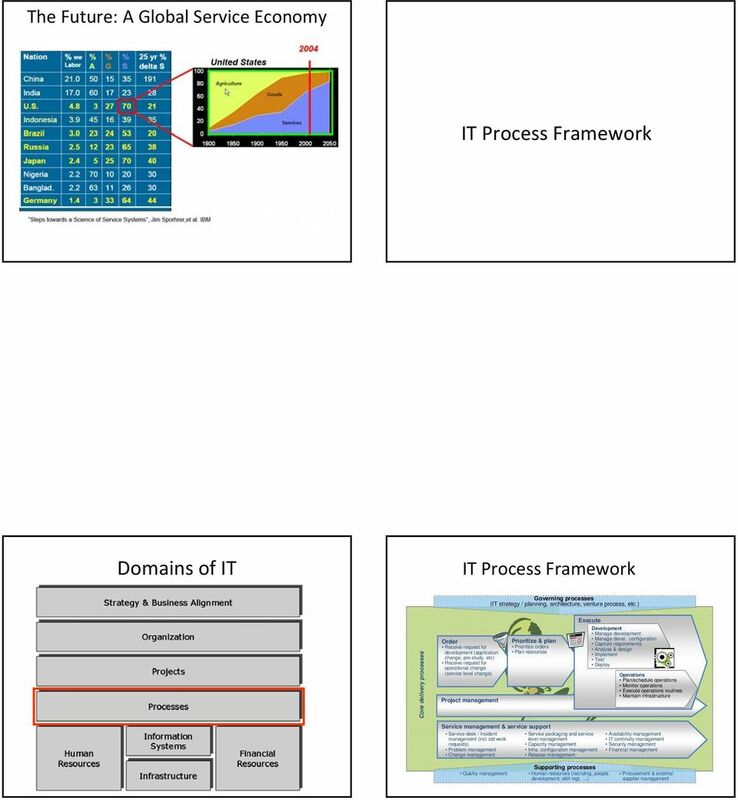 Download "IT Organisation in Change"
1 IT Organisation in Change ENTERPRISE SOFTWARE ENGINEERING & SOFTWARE ENGINEERING IN THE ENTERPRISE IT change Quality of IT s Costs of IT s change Future Now Perfect IT s Business Demands Can we deliver? 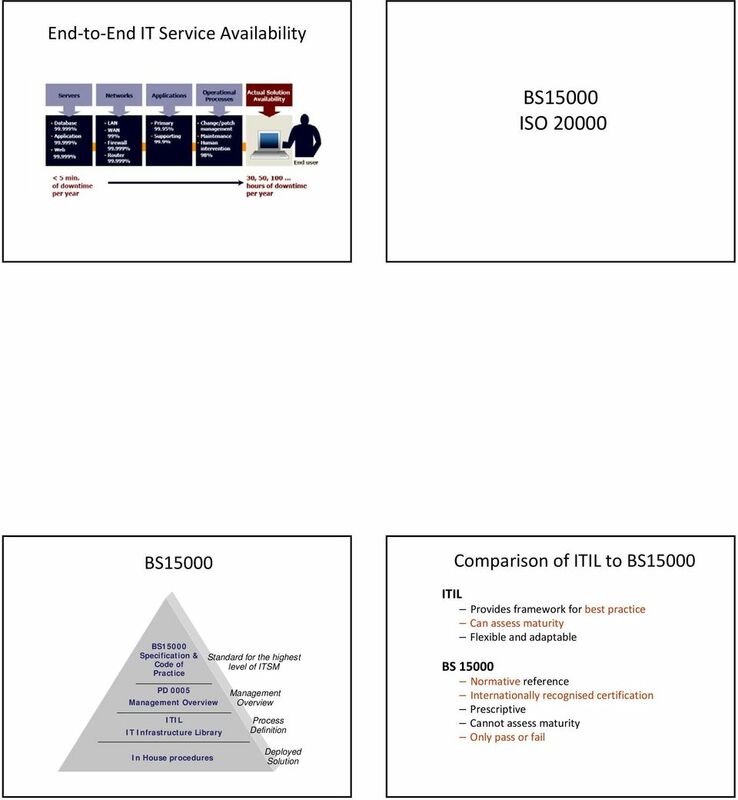 Consistent and accurate solutions Available, Usable, Secure & Perform All the time? 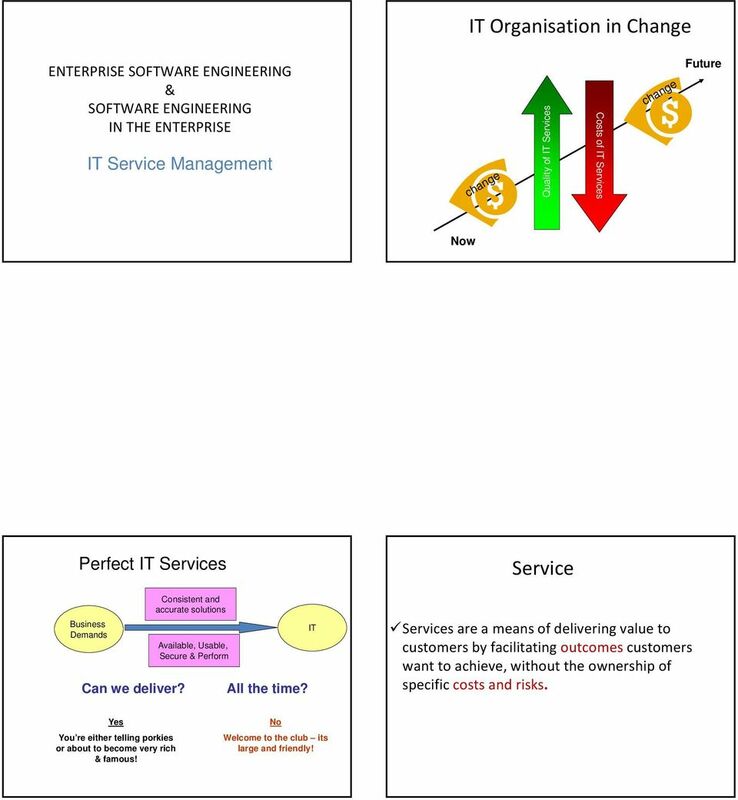 IT s are a means of delivering value to customers by facilitating outcomes customers want to achieve, without the ownership of specific costs and risks. Yes You re either telling porkies or about to become very rich & famous! No Welcome to the club its large and friendly! 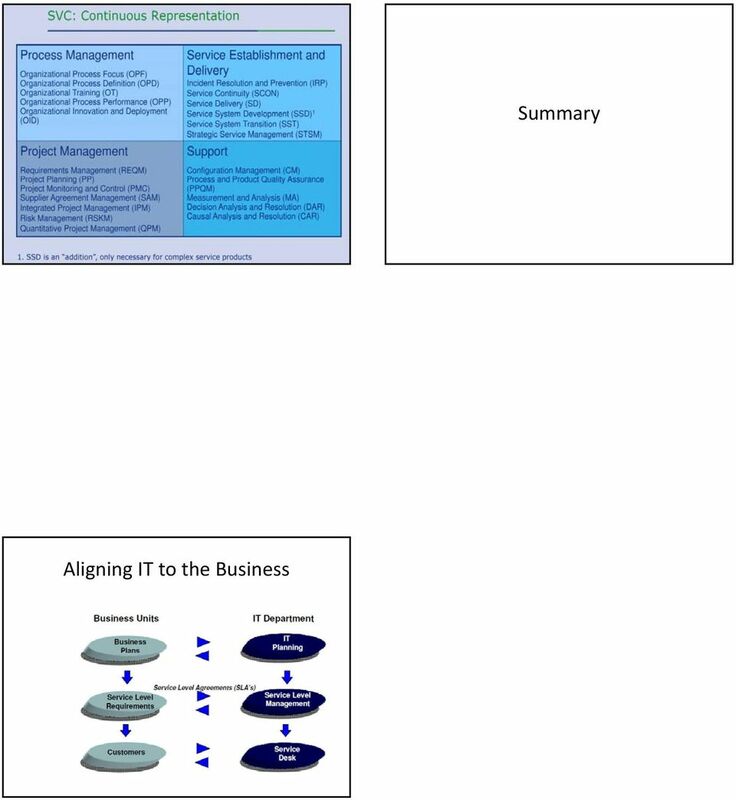 6 Support Processes Delivery Processes Customers Desk Incident Alerts Business Process Owners Level Problem Configuration Change Capacity Financial Mgt Availability IT Continuity Release Infrastructure Change Responsibility Pyramid Incident Delivery Desk Financial Problem Incident Level Capacity Availability Continuity Change Release Configuration Support Description End users (the customers of the IT department) need a clearly defined point of contact. 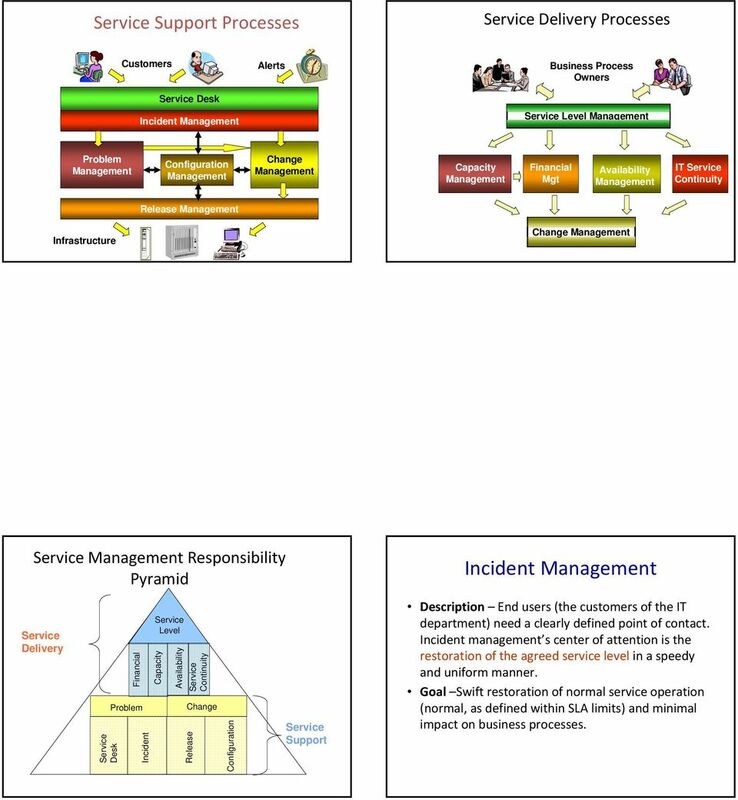 Incident management s center of attention is the restoration of the agreed service level in a speedy and uniform manner. 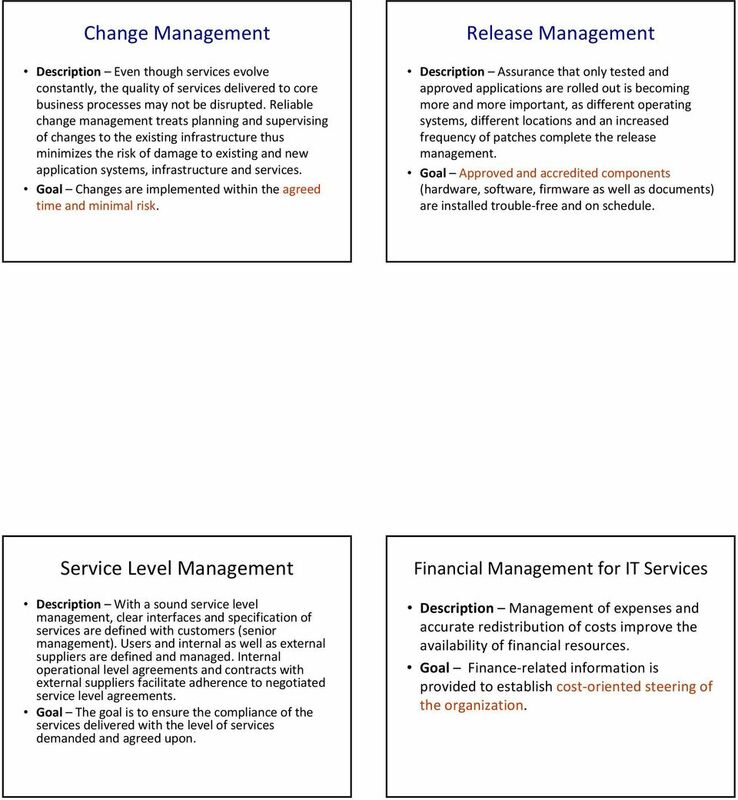 Goal Swift restoration of normal service operation (normal, as defined within SLA limits) and minimal impact on business processes. 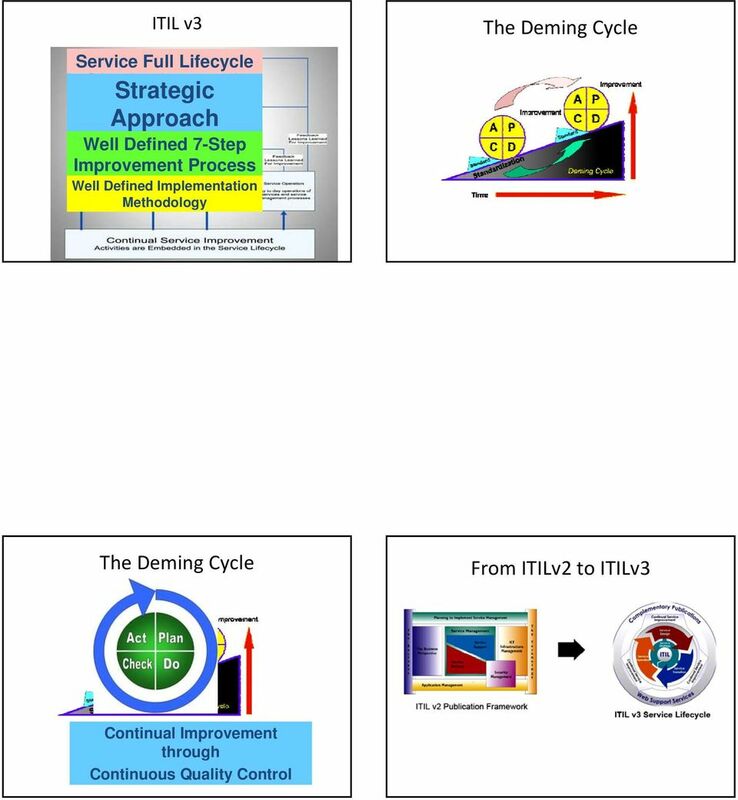 8 Change Description Even though services evolve constantly, the quality of services delivered to core business processes may not be disrupted. 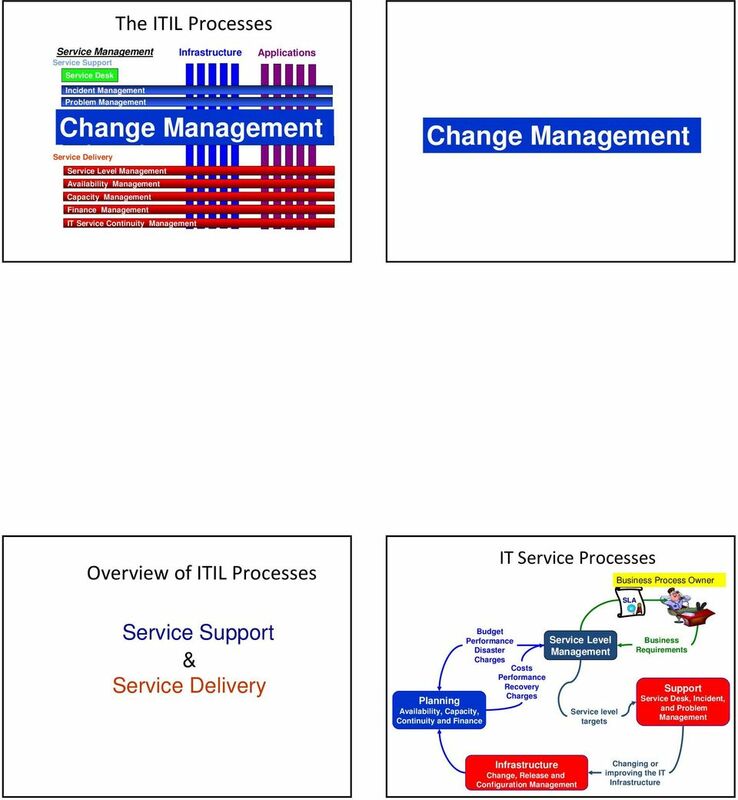 Reliable change management treats planning and supervising of changes to the existing infrastructure thus minimizes the risk of damage to existing and new application systems, infrastructure and services. Goal Changes are implemented within the agreed time and minimal risk. Release Description Assurance that only tested and approved applications are rolled out is becoming more and more important, as different operating systems, different locations and an increased frequency of patches complete the release management. Goal Approved and accredited components (hardware, software, firmware as well as documents) are installed trouble free and on schedule. 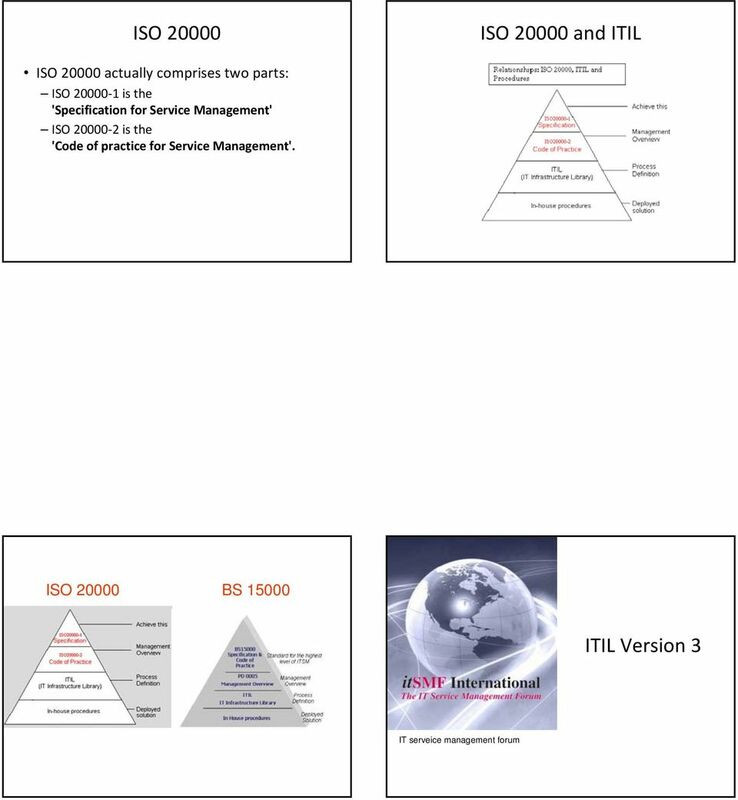 Level Description With a sound service level management, clear interfaces and specification of services are defined with customers (senior management). Users and internal as well as external suppliers are defined and managed. Internal operational level agreements and contracts with external suppliers facilitate adherence to negotiated service level agreements. Goal The goal is to ensure the compliance of the services delivered with the level of services demanded and agreed upon. Financial for IT s Description of expenses and accurate redistribution of costs improve the availability of financial resources. Goal Finance related information is provided to establish cost oriented steering of the organization. 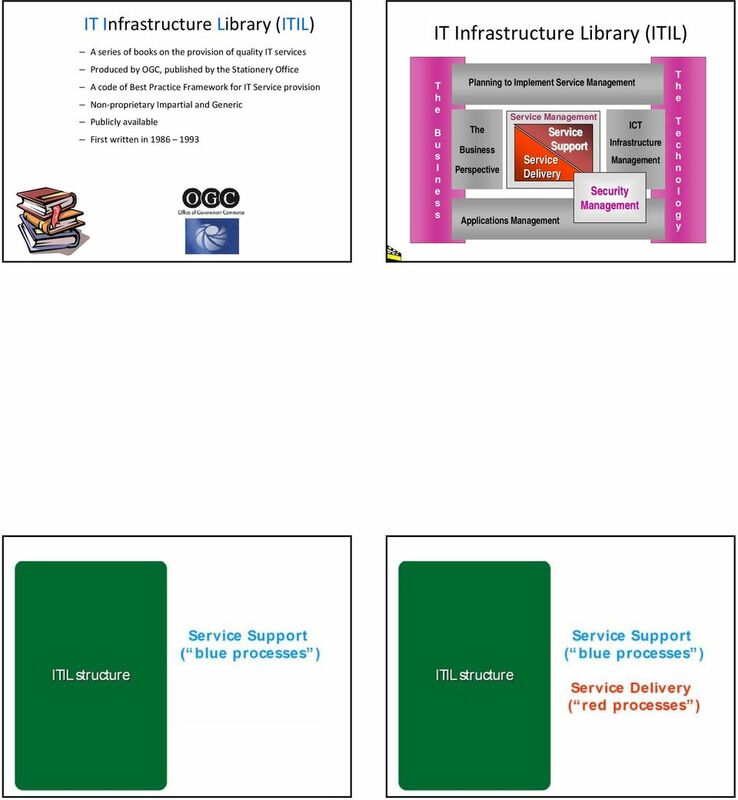 9 Capacity Description Proactive identification of performance requirements ensures a continuous level of service and a proper management of resources. 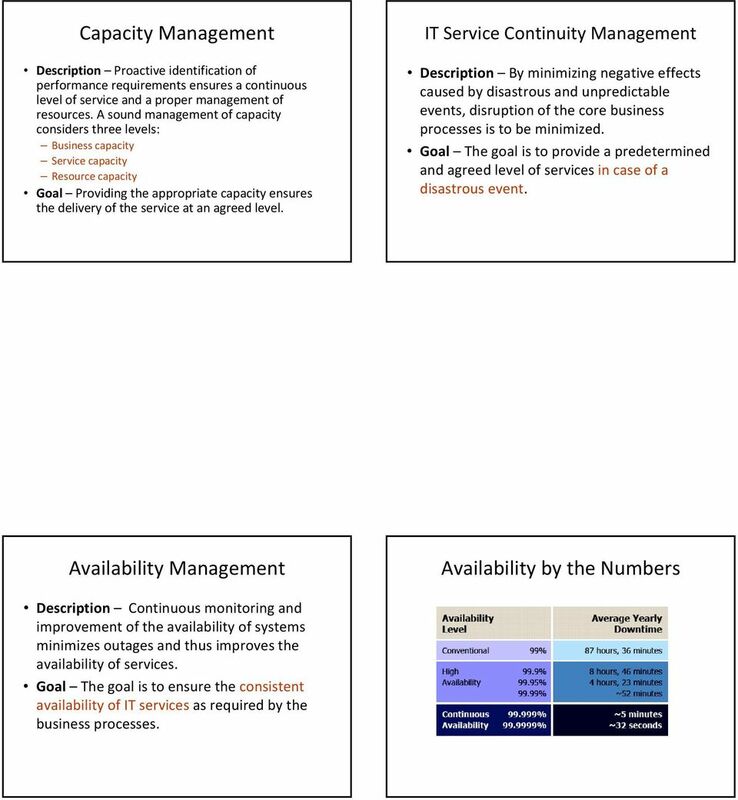 A sound management of capacity considers three levels: Business capacity capacity Resource capacity Goal Providing the appropriate capacity ensures the delivery of the service at an agreed level. 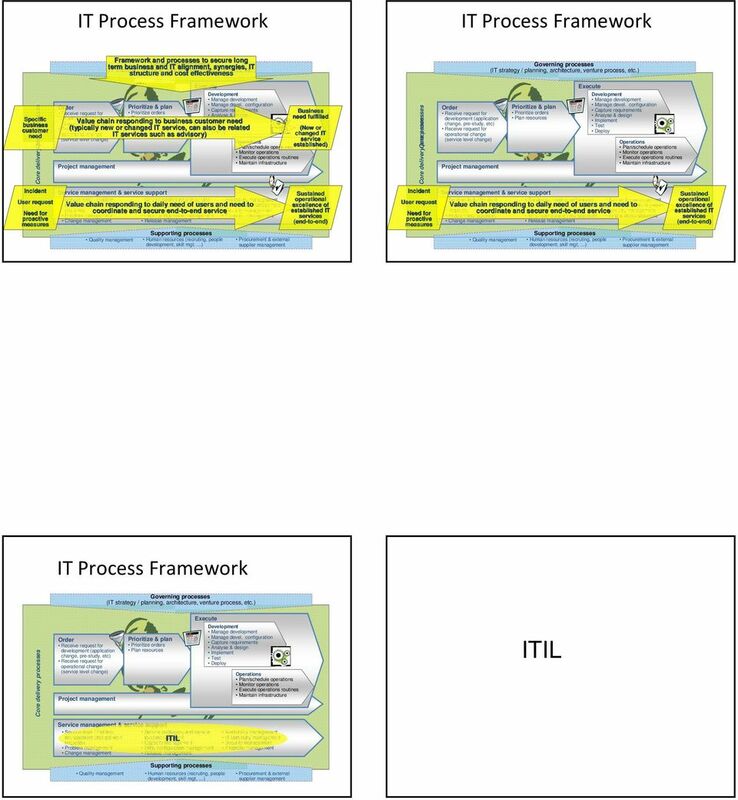 IT Continuity Description By minimizing negative effects caused by disastrous and unpredictable events, disruption of the core business processes is to be minimized. Goal The goal is to provide a predetermined and agreed level of services in case of a disastrous event. Availability Availability by the Numbers Description Continuous monitoring and improvement of the availability of systems minimizes outages and thus improves the availability of services. 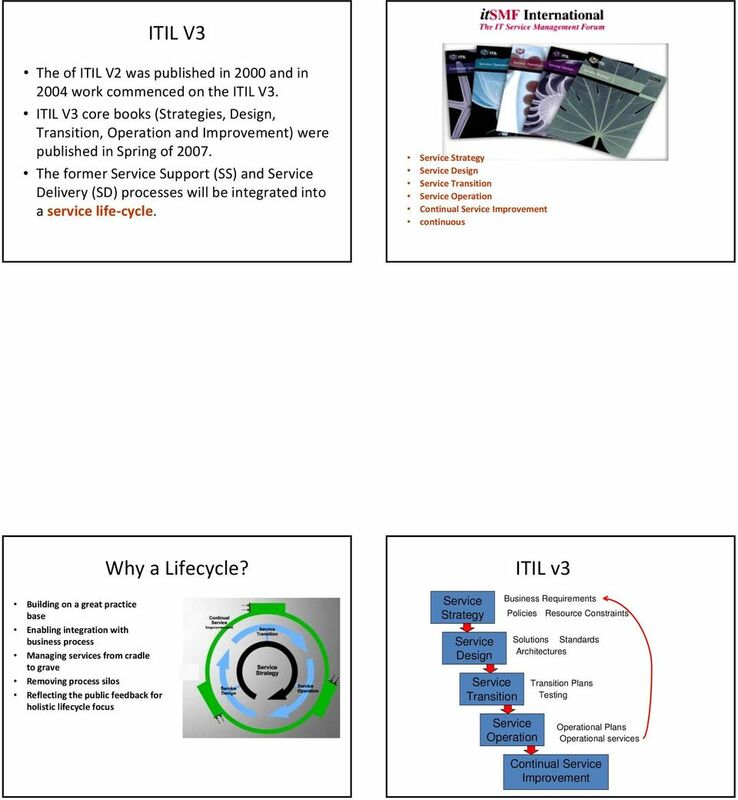 Goal The goal is to ensure the consistent availability of IT services as required by the business processes. Topics. 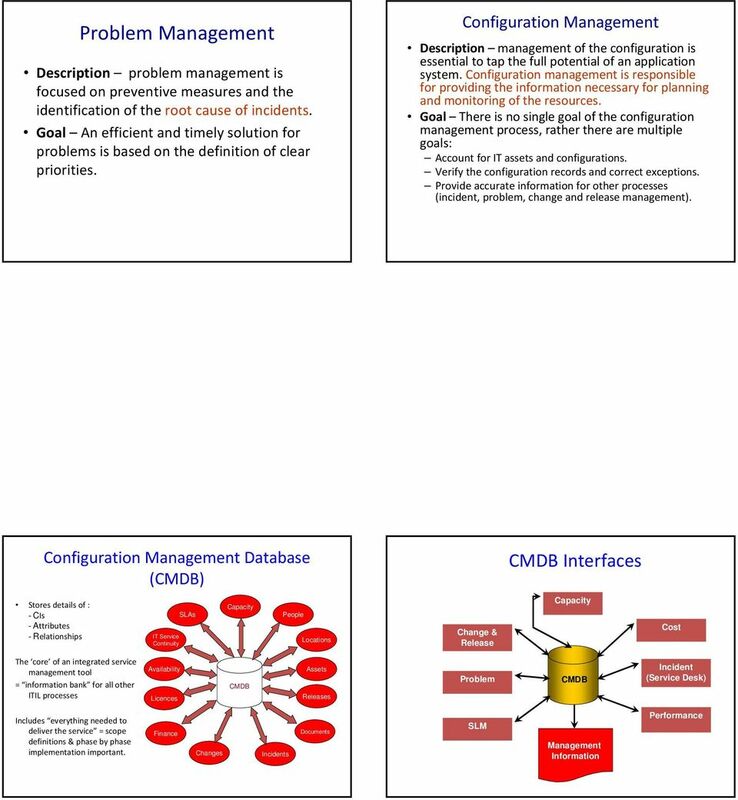 Why do people think they need a CMDB? 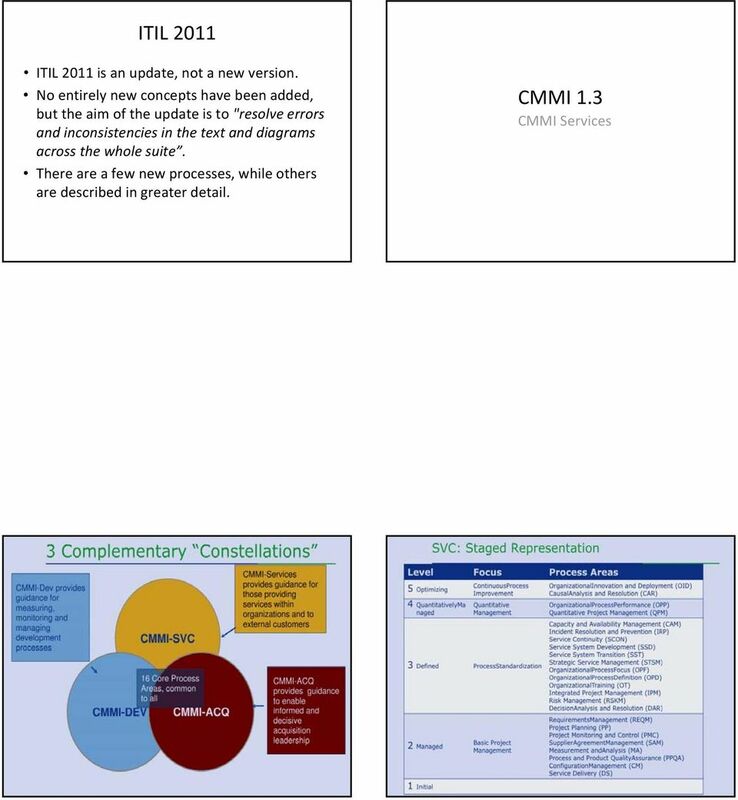 What has configuration management become in the 21 st century? Trainning Education Services Av. Paulista, 777-15º andar SP Tel/Fax: 55+ (11) 3323-1676 www.trainning.com.br comercial@trainning.com.